Keeping a clean home used to seem impossible. I have 2 children and 2 dogs. You add in a husband and oh holy night, the house is a mess. While I could hide things in the closet or just overlook them, that doesn't get rid of the nice balls of white in the corners. That's the good thing about having your main room as tile. Not as much vacuuming but boy oh boy do you know when its been more than a day since you've swept! Little puppy friends are forming in the corners of your house from the dander that has left your beloved pets! Well, at least that is what happens in my home. The Dyson Ball Animal is the perfect vacuum for my little family. I asked the husband to put it together for me, but as I sat next to him making sure he didn't hurt our newest baby watching, I knew I could have easily put it all together. There are a few attachments involved but what vacuum doesn't have parts these days? The best feature? The ability to go on carpet or tile/wood floors without the push of a button! 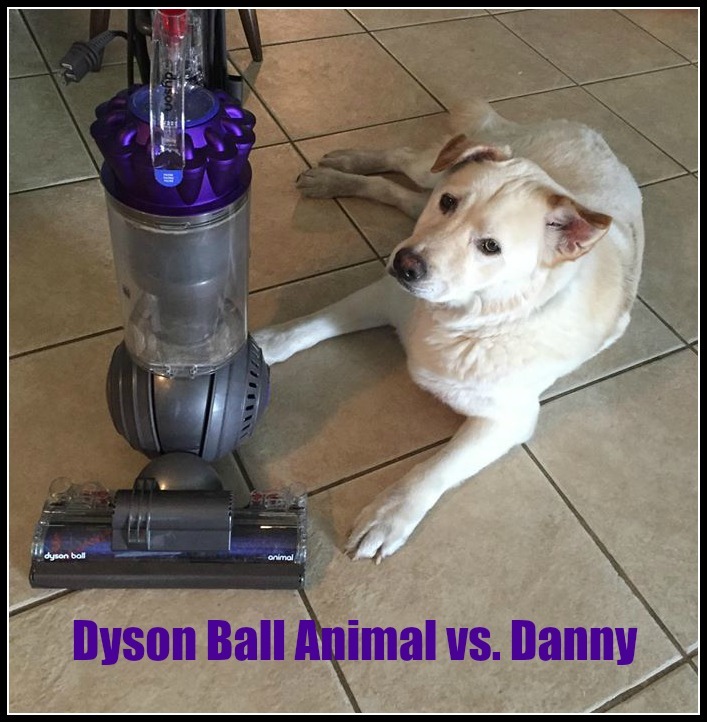 Not only is the Dyson Ball Animal perfect for my family, its great for a home like mine as well. We have carpet in each bedroom only. My poor, big white dog Danny.. He wasn't meant to live in Florida. This poor pup has lost his coat about once ever 2 months since moving to this sunny paradise. While I love it, I suppose cleaning up his hair is a side effect to the whole thing. I'll take it, especially now that I can use the Dyson Ball Animal in the fight against dog hair! Both of my dogs are fairly large and never took to dog beds. They sleep wherever I am, it seems. My side of the bed always has a lot more hair to clean up than my husband's. Upon the first time using the new Dyson Ball Animal, I used our other vacuum the day before. I thought it was doing a pretty good job until I picked up this much hair just 18 hours later! All of that dander picked up in just that small space you see there. Up and down the strip of carpet twice and there you have it. 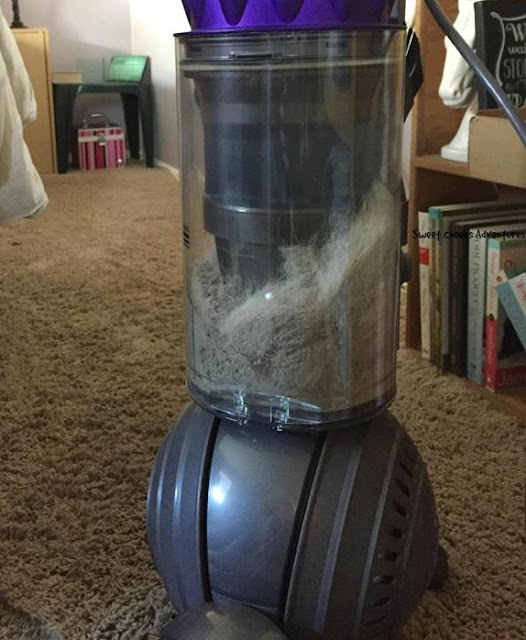 It's almost like the other vacuum wasn't picking up anything. The suction in the Dyson Ball Animal is simply amazing. Now that we've established that my dog has hair and sheds like crazy around here, let me show you how well this vacuum works. Cooper got a new car mat for Christmas. 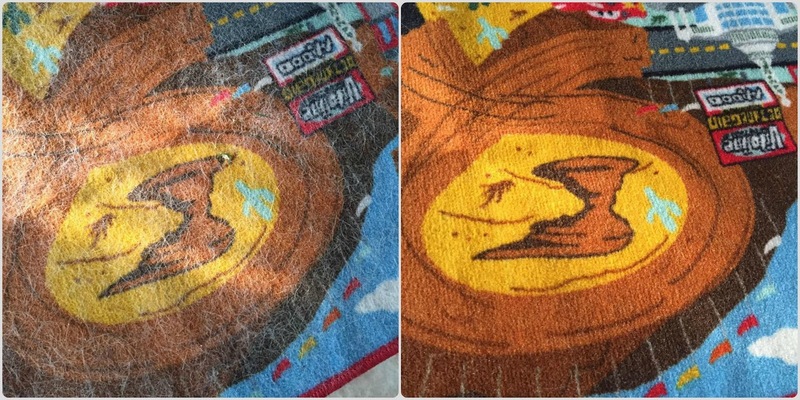 This is the type of mat that you can lay on the floor and drive his little cars on. Danny also thinks this mat is for him. I've had to offer treats to get Danny off this thing! Unfortunately, Danny leaves a trace when he is there for more than .5 seconds. Well, just look for yourself! Clearly you can see in the picture on the left, Danny has been making himself at home on the car mat. This is over a 3 day period of taking it out of the box and him laying on it. I had no idea the amount of hair that dog releases throughout our home until I started to pay attention with the use of the Dyson Ball Animal. It did such a great job cleaning up the hair, right off the mat! As you can see, Danny has not won the fight against the Dyson Ball Animal. Teaming up with Lilly, they still cannot defeat the greatness of the Dyson. Maybe they'll come back to win another day, in another way. The Dyson Ball Animal works as a regular vacuum, on carpet and off. This model's suction picks up dirt and microscopic dust. It self adjusts to the distance between the brush and the floor, may it be carpet, tile or wood. It comes with accessories for getting in there and getting the job done! The filters are removable and able to be cleaned. Don't forget to do that every 3 months! Dyson cyclones capture more dirt and microscopic dust than any other cyclone. Dyson upright vacuums have whole-machine HEPA filtration, capturing over 99% of pollen, mold, and bacteria – keeping them trapped in the bin. You can purchase the new Dyson Ball Animal at your local Best Buy as well as many other establishments. If you have a pet like Danny, you need this vacuum. If you are a human that loses hair, you need this vacuum. Trust me on that. I am so jealous! I have wanted a Dyson, well, FOREVER. Sounds like an amazing machine for pet owners! I have always wanted a Dyson vacuum cleaner. With five cats, this sounds like the one that I need. I have had a Dyson vacuum for years and I love it. I now want to buy the cordless handheld one for everyday clenaup around the kitchen. Been wanting a Dyson also for a long time I don't own pets other then fish but I have some messy guys living around me and my daughter loves to get crumbs on my carpet my vaccum is one of those older curby vacuums so it is time for a upgrade for me. You did a excellent review reminded me that I been needing to add it to my list of things to buy once income tax time comes. This is just the kind of vacuum pet owners would love. Our cat leaves tons of fur wherever she sleeps. I love almost any Dyson, so I'm sure I would love this one, too! Ah, pet hair. The struggle is REAL. I love Dyson. Their vacuums are top notch. I've literally never heard of anyone having a problem with them. Our Newfoundland always won the battle against our vacuum cleaner! When we get another dog, we will definitely be checking out this one! That's a LOT of dog hair!! We don't have any pets that leaves hair all over the place but there's always crumbs all over the place thanks to my messy son. Wow, look at all those hair. I want this! Wow what a difference! 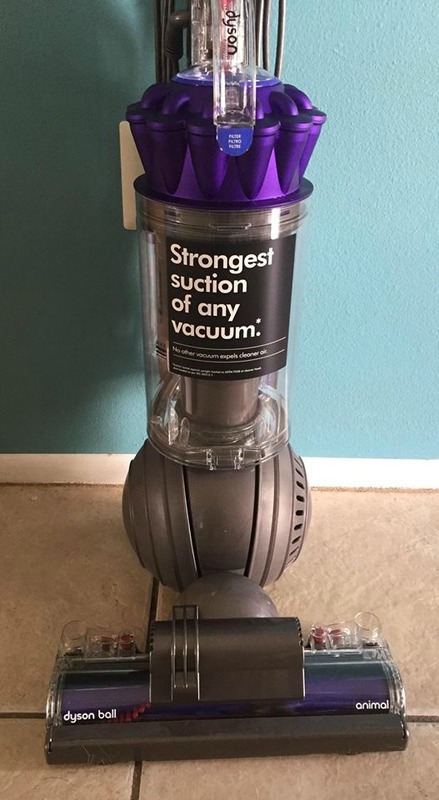 I have a Dyson and I love it, they definitely work like no other vacuum. 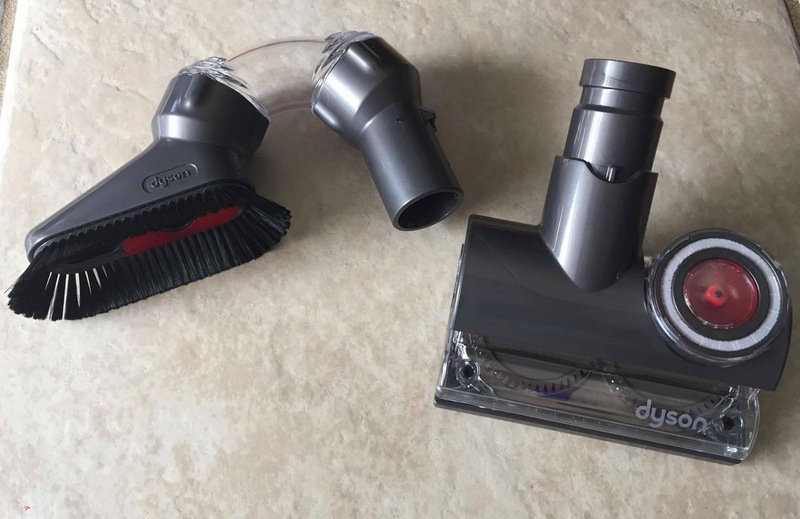 Just awesome & Dyson vacuum cleaner looks like a perfect choice particular when you have few pets at home. I love how easy it is to use & the results are quiet amazing as well. I would want one for my home. I have heard great things about Dyson. I think it is a must if you have pets. This leaves the area nice and clean. This option may not be safe for highly allergic people.